(6:00 p.m. BST) -- P&O Cruises' new ship, Iona, will sail exclusively to the Norwegian fjords during its inaugural season, the line has announced. 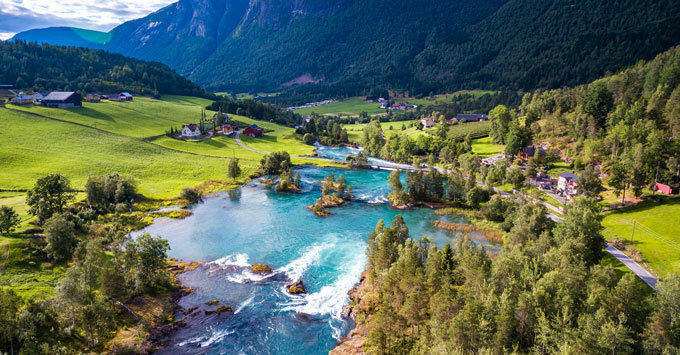 The 5,200-passenger ship, which launches in May 2020, will offer seven-day roundtrip cruises from Southampton to iconic destinations including Geirangerfjord, Stavanger, Alesund and Olden. Iona will be P&O Cruises' first Liquefied Natural Gas (LNG)-powered ship, making it the cleanest and the greenest in the fleet. P&O Cruises Senior Vice President Paul Ludlow said: "From the initial stages of her build, we knew that Iona would be sailing to the fjords, and as such, every single detail has been designed to maximise the views, the ever-changing vistas and remarkable landscape. "SkyDome, with its glass roof and temperature control, will ensure that guests have an unrivalled viewpoint as the ship sails through the breathtaking vertical expanses of narrow gorges and blue sky and past mountains, glaciers and wildlife." Iona is currently being built at the Meyer Werft shipyard in Papenburg and will be launched in May 2020. Cruises will go on sale in September 2018. P&O Cruises has developed a diverse range of excursions and activities, including a helicopter ride over Pulpit Rock, rides on the dramatic Leon Skylift to the summit of Mount Hoven and trips down Norway’s fastest zipline, which starts at 643 metres high at Mt Ulriken and drops to 300 metres at Mt Floyen. Last month, the line revealed more features of the ship, including new-to-the-fleet dining concepts. it also said it will scrap fixed-time dining.